Factors Advance - The money the factor sends to the client up front, after the verification process is complete, and before the factor receives its money from the client's customer. The advance is figured as a percentage of the face value of the factored invoices. If you have invoices for goods or services performed, you qualify for factoring. It's that simple. Do you offer terms to your customers? 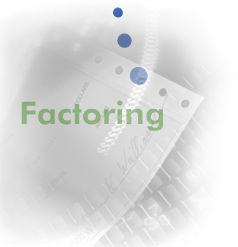 Factoring eliminates the financial gap for the payment terms (ie Net 30) that you offered to your customers. Are your company sales growing? Companies growing sales are prime candiates for factoring. The greater your sales growth the greater the need for factoring. Do you have time to wait for Bank Financing? Banks use stringent financial ratios and formulas to loan money. The typical bank funding process is lengthy. Setting up a factoring account with us takes just days and can get you cash quickly. If you answered YES to all these questions we will be able to help you turn your invoices into cash.